Monte Carlo - Roger Federer obtained the all-clear from pregnant wife Mirka before preparing to line up for the start of his clay season at the Monte Carlo Masters, the tennis newlywed revealed on Tuesday. "Mirka was completely relaxed about whatever decision I took," said world number 2 Federer, who opens at the Country Club on Wednesday against Italian Andreas Seppi. "I feel like I have been on a honeymoon for the last years, so I don't feel necessarily I need to go somewhere, to a special place, to celebrate with her. Miami (US), Apr. 4: Swiss tennis player Roger Federer was reduced to a rare bout of racquet-bashing as he was toppled in the semi-finals of the Miami ATP Masters 1000 by Serbian Novak Djokovic. Djokovic, ranked number three in the world, beat the world number two 3-6 6-2 6-3 in one hour and 46 minutes. Federer, the 13-time Grand Slam champion who is in search of his first title of 2009, comfortably won the first set as Djokovic found his feet, but could find no answers after that - finishing with 35 unforced errors. Miami - An irate Roger Federer smashed a racket for the first time in memory as the normally calm Swiss stumbled to a 3-6, 6- 2, 6-3 loss against Novak Djokovic in the Miami Masters semi-finals on Friday. Federer reduced his Wilson to scrap in a flash in the third game of a frustrating final set against the third seed as the Serb claimed a 3-0 lead after winning his sixth straight game in a turnaround. At one point, Federer lost five of six service games. Miami - Roger Federer is feeling the natural frustration of a tennis hero whose last title came just shy of six months ago. The usually solid Swiss smashed his racket at a moment of third-set tension as he went down to a 3-6, 6-2, 6-3 semi-final loss to Novak Djokovic at the Miami Masters. He last lifted a trophy at his home Swiss Open in Basel on October 20. Federer, who lost his Australian Open trophy to Rafael Nadal this season, is feeling his former dominance slip. Miami - Irate Roger Federer smashed a racket for the first time in memory as the normally calm Swiss stumbled to a 3-6, 6-2, 6-3 loss against Novak Djokovic in the Miami Masters semi-finals on Friday. Federer reduced his Wilson to scrap in a flash in the third game of a frustrating final set against the third seed as the Serb moved claimed a 3-0 lead after winning his sixth straight game in a turnaround. Miami - Roger Federer stretched his run of form at the Miami Masters as he completed his 33rd victory Tuesday in his 11th straight year at the event, reaching the quarter-finals 6-3, 6-2 over Taylor Dent. Dent, 27, spent six months in a body cast and underwent three back operations as he missed three years of ATP play due to the serious problem. The US player returned to the game at the start of 2009 with a ranking just inside the top 500 after his inactivity. Miami - With Roger Federer's new baby due over the summer, the Swiss insists that his tennis work ethic won't be compromised - it's just that he and girlfriend Mirka will just go about the tennis business with a baby now a part of the mix. "I'll still take decisions that are best for my game, you know. I have had a team in the past, there's just an added a member. It's going to be all right," he said after reaching the fourth round of the Miami Masters. Miami - Roger Federer polished his mighty game at the continued expense of Nicolas Kiefer as he hammered the German 6-4, 6-1 to rip into a third-round place on a cloudy, muggy Sunday afternoon at the Miami Masters. The Swiss second seed and two-time winner at Crandon Park spent little more than an hour in the rout and never faced a break point as he beat the veteran for the 11th consecutive time. Miami - Former champions Roger Federer and Novak Djokovic revved up their game with overwhelming opening wins to power into the third round of the Miami Masters on Friday as seeds took centre stage. Number 2 Federer, who triumphed in 2005-2006 at Crandon Park, found his form in a runaway second set as he defeated American Kevin Kim 6-3, 6-2. Djokovic, who triumphed in 2007, beat Canadian Frank Dancevic 6-3, 6-2. Miami - Roger Federer says that his commitment for Swiss Davis Cup play certainly doesn't turn on a huge payday. The number 2 is happy to play for relative pocket change - as long as the event does not conflict with his fitness or career goals. "Honestly I never heard of money being the issue here, why players are not playing," he said of the lack of big names who consistently compete in the worldwide team event. "Sometimes I walk away with 5,000 or 10,000 dollars. Miami - Roger Federer re-emphasized his future commitment to tennis on Wednesday as he prepared for a start at the Miami Masters, saying the pending summer birth of his first child would not change his fervor for the game. "I'm very excited, you know, so is (longtime girlfriend) Mirka. We're looking forward to see how it's going to impact our lives," said the Swiss second seed, who will open after a bye against US player Kevin Kim at the weekend. Indian Wells, California - Roger Federer is optimistic about reversing losses to Andy Murray in the pair's last three matches when they meet in Saturday's semi-finals at the Indian Wells Masters. In the six months since the Swiss claimed his 13th Grand Slam title over the Scot in the US Open final, Murray has risen to the occasion with victories in Madrid, Shanghai and Doha to start the year. But the experienced Swiss reckons that it is merely a matter of a few fine adjustments before he resumes overturning a surprise 2-5 record against the world number 4. Indian Wells, California - Roger Federer insisted on Saturday that his impending summer fatherhood won't impact his tennis as he strives for more history in the sport. "I've always had the dream that once I became number 1, that if I have a child I hope I have it early enough so he can see me playing," he said after reaching the third round of the Indian Wells Masters 7-6 (7-4), 6-4 over Marc Gicquel. "This is very exciting, you know. Washington, Mar 13: Tennis ace Roger Federer and girlfriend Miroslava "Mirka" Vavrinec are expecting their first child together. The 27-year-old Swiss star confirmed the news on his blog. “Mirka and I are excited to let you know that we will be parents this summer!" People quoted Federer as writing on his blog. "Mirka is pregnant and we are so happy to be starting a family together. This is a dream come true for us. Indian Wells, California - Roger Federer Thursday revealed that he will become a father within months, saying long-time girlfriend Mirka Vavrinec is pregnant with the couple's first child. "I have some really awesome news to share with all of you: Mirka and I are excited to let you know that we will be parents this summer!," the Swiss told his website. "Mirka is pregnant and we are so happy to be starting a family together." The world number two called the big event "a dream come true for us." Indian Wells, California - Roger Federer and Darren Cahill have gone their separate ways after a trial coaching run in Dubai was scuppered by a potentially killing travel schedule for the Australian. Federer, second seed at the Indian Wells Masters, whose ATP play begins Thursday, revealed that Cahill had withdrawn from the potential all-star arrangement due to the tyranny of travel on the tour. "We decided not to do it," said the Swiss player Wednesday after a hitting session. 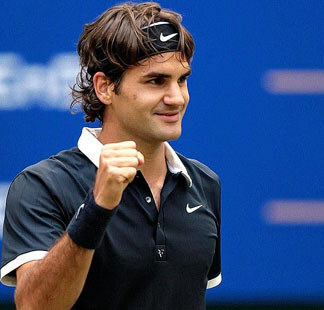 Federer said he will continue to work with Swiss Davis Cup skipper Severin Luethi. Melbourne, Mar. 10: Swiss tennis great Roger Federer has hired Darren Cahill as his new coach. Cahill, who has previously coached Andre Agassi and Lleyton Hewitt, will begin his association with Federer at the Indian Wells this week, reports The Australian. Cahill and Federer, who has been off the circuit for six weeks with a back injury, have been working together in Dubai, where the Swiss star has a base. Federer has previously worked with other Australian coaches Peter Carter, who passed away in 2002, and Tony Roche. Dubai, UAE - Rafael Nadal joined Roger Federer on the injury list for next week's Barclays Championships, with the Spanish No. 1 pulling out on Thursday to rest from a knee injury. Nadal's website said that he had to cancel his trip to Dubai due to doctor's orders. Separately, Federer withdrew with a back injury, which will also cause him to skip Switzerland's Davis Cup tie in Alabama against the United States March 6-8. Geneva - Roger Federer has withdrawn from next week's Barclays Championships as well as the March 6-8 Davis Cup tie against the US with a lingering back injury. "I'm disappointed to announce that I am withdrawing from both Dubai and the Davis Cup tie in the United States," the world number two said on his website. Melbourne, Feb. 2 : Australian Open champion Rafael Nadal refuses to believe he has Roger Federer''s number just yet, despite continuing his grand slam dominance over the so-called greatest player ever. 22-year-old''s own tally to six.